This recipe is pretty high brow for the foods I normally would make. I stumbled on the recipe and gave it a try. All I can say is WoW! 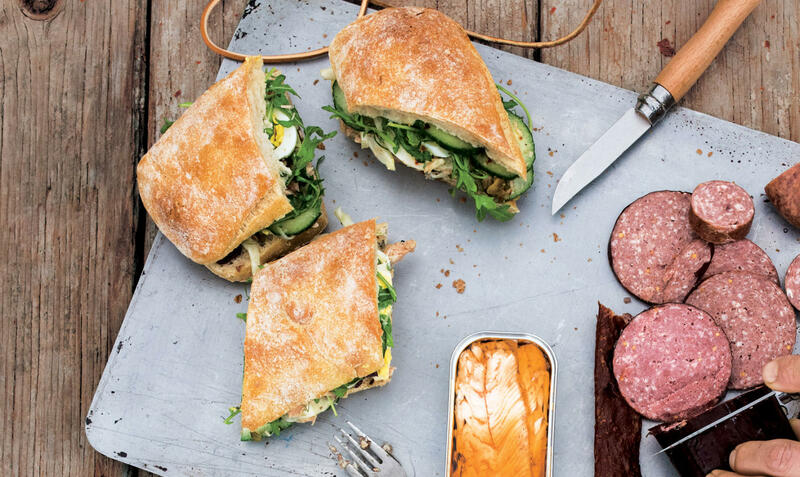 Just give this Pan Bagnat with Fennel a try before you say no way. Toss fennel, olives, oil, vinegar, capers, and red pepper flakes in an airtight container or resealable plastic bag; season with salt and pepper. Do Ahead: Fennel-olive mixture can be made 2 days ahead. Cover and chill. Toss fennel-olive mixture with cucumber and tuna in a medium bowl; season with salt and pepper. Let sit, tossing occasionally, 10 minutes. Scoop out inside from top half of bread; discard (or save for a snack!). Layer bottom half of bread with tuna mixture, then top with eggs and arugula. Close up sandwich. Place a large heavy skillet or pot on top of sandwich to weigh down and let sit at room temperature, turning once, until evenly pressed, about 2 hours (if making sandwich at home, or storing in a cooler while you hike, wrap it up tightly in plastic wrap before you press it). Slice pan bagnat into wedges just before serving.